As the repetitive theme in the series I decided to follow my ceramic quilting inspiration and use my favourite pottery shape – the small lacrymal vase found in Carthage. I like using pottery images in quilting and I have used them many times, but incorporating them into a modern composition will be a challenge in itself. I have some black and white commercial fabrics, but they are somewhere in a box … so I decided to print the hand printed fabric I needed. 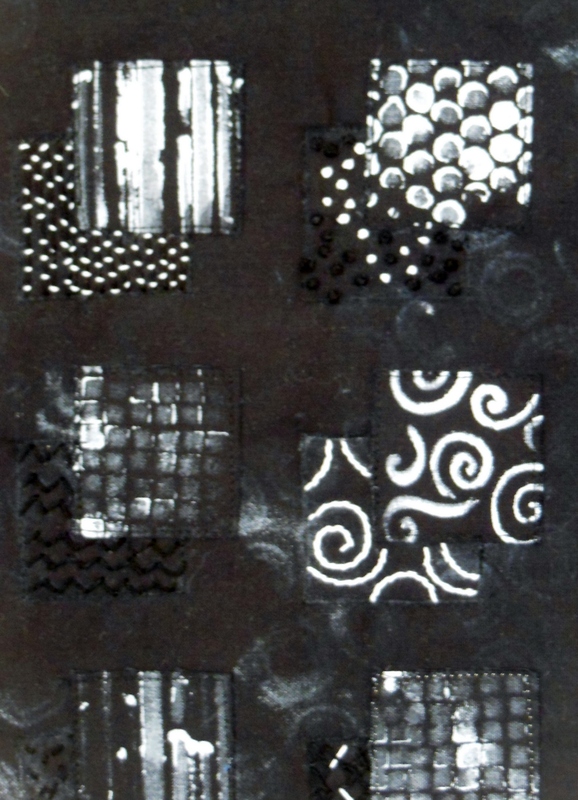 I used stencils and acrylic paint, black on white and white on black. Firstly I did a frottage on the black background to “break” the solid black. For that I used a grid underneath the fabric and white acrylic paint. 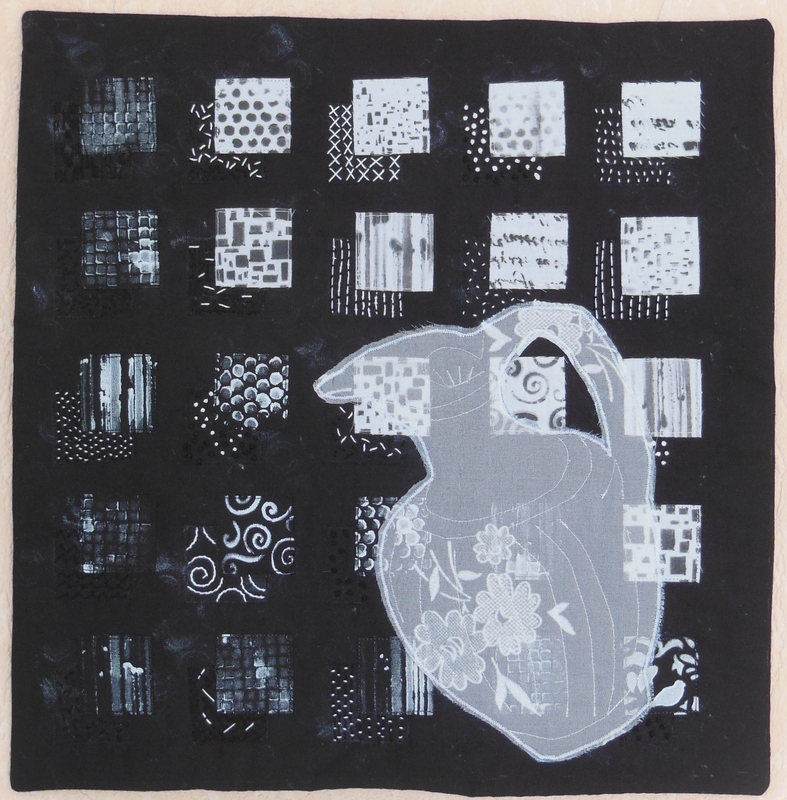 I cut my printed fabrics into 1.5 squares et fused them on the background going from the darkest to the lightest. I drew a shadow shape around each square and started filling the shadow shapes with hand-embroidered stitches, sometimes echoing the stitches with the print (French knots for dots) sometimes not, using perlé thread N°8. The pottery was appliqued at the end, by machine with a satin stitch. The shape was cut out from a piece of transparent curtain, the squares can be seen through. The checkered background could be a rug or a tile wall. The quilt is finished with a facing. 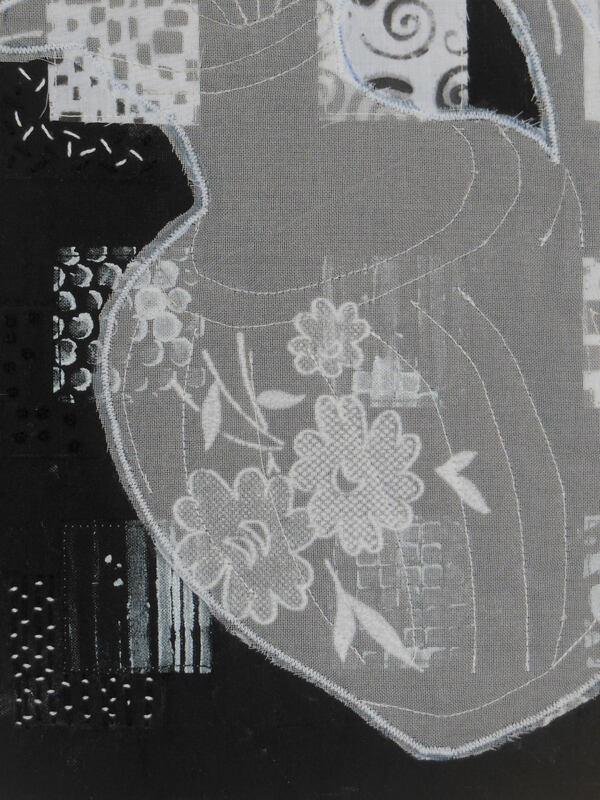 Black and white, frottage, stencilling, hand stitching, embroidery, cotton fabric, acrylic paint, ceramic quilting inspiration, pottery images in quilts, hand printed fabrics, fused fabric art, checkered background. The background squares are stunning, the mix of the paint and stitch is amazing, this is a piece which needs to be seen close up! The use of the transparency for the jug works really well. At first sight I thought you used commercial fabrics, but you created your own black and whites. How great. I like the checkered background and the transparent vase makes your quilt complete. It is amazing how every time you find a different way to go on with your pottery series. I love all the different printed squares you have been using for the background and the way they shine through the vase. Really like how you extended the squares with hand quilting. Very interesting use of transparency for the pottery. Super! You have made a brilliant job of creating the printed squares, which sit beautifully behind the transparent vase. This is a lovely piece, well done. I love how you created your own fabric for the background with your stenciling and painting and the transparent vase and stitching finished it off beautifully. Lovely Chantal! Very cool technique. I like the result. I would know your work in any color! I love how you made the background. It manages to create movement and depth and highlights your vase in a perfectly balanced way. Chapeau! Pottery again, not difficult to recognize this as yours Chantal, and you managed to create it in a totally different way. Love your background fabrics, you reached such lovely results with your painting and stitching combination. And the vase makes me think of the sound of clear, fresh water on a warm day. Well done!